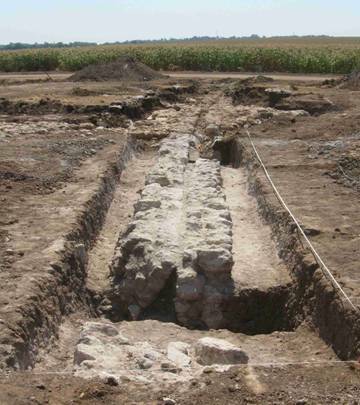 This section of the Early Islamic Kaanatt Benth el-Kaffar aqueduct (built in 715-717 CE to supply the Abbasid city of Ramla) was investigated in July-August 2009. Following IAA test digs near Kibbutz Na’an in preparation for a new railway line, further archaeological investigations were necessitated. The excavation, covering a total area of 225m², was directed by Eli Cohen Sasson. Some 20m of the Abbasid aqueduct were uncovered, adding to our corpus of knowledge about its construction and taphonomy. Confirming previous work, we found that the aqueduct was constructed of a foundation on which rested two parallel walls spaced 40cm apart. In this plaster-lined channel ran the water, at a very gentle slope of 0.05º. The excavation raised some very interesting questions about the engineering of this aqueduct. 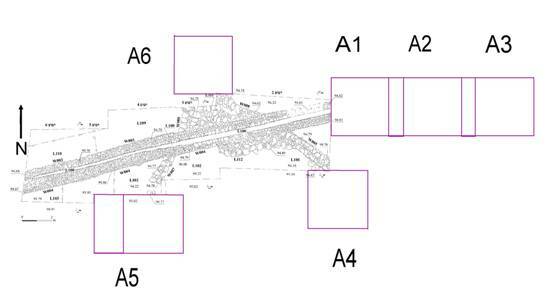 Several unidentified stone features (W101, W005, A4, A6) were found to intersect with the aqueduct’s line within the area under investigation (see adjacent plan). The function of these leveled stone areas and walls remains unclear, but they may in part have served to counteract soil creep stress that was acting upon the aqueduct. On either side of the point of intersection with these features, the aqueduct’s south wall at some point had given way and was found leaning against the other (north) wall. As well as kindly sealing the aqueduct channel for archaeologists to later dig up, the tilt of this wall may support the interpretation of the unidentified stone features as serving an engineering function.